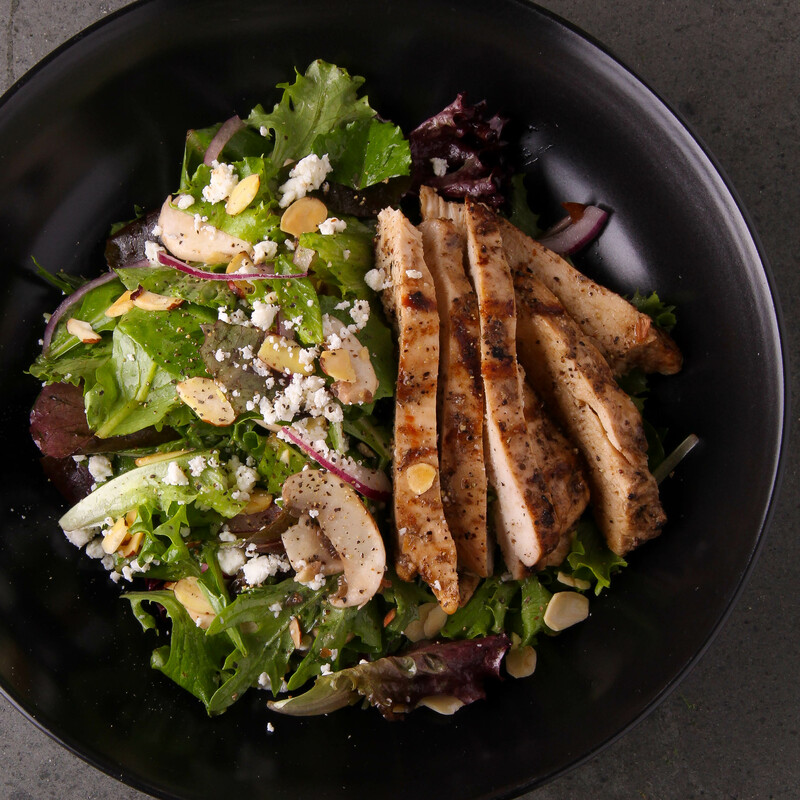 Grilled chicken salad is usually a safe bet for lunch so like most of us, I’ve ordered it countless times and tasted countless versions. It should always be good…it’s pretty hard to mess up….yet rarely am I blown away. But Proud Larry’s, a fixture in Oxford, Mississippi for the last 20 years, proved to me that a simple grilled chicken salad can still impress. The ingredients are fresh and the chicken is tender and warm. However, it’s probably the homemade Citrus-Cumin Dressing that makes this salad so memorable. Here is my copycat recipe and I think it comes pretty close to the original. This tasty combination will become a favorite to serve for lunch or dinner. Go to No-Stick Grilled Chicken Marinade recipe for best grilled chicken for this salad. 2. In a large bowl, toss together the greens, red onions, mushrooms and almonds. Shake vinaigrette well and drizzle about 1/2 cup over the greens. Toss to coat well and add more vinaigrette if desired. 3. Divide salad between 6 shallow bowls, sprinkle each with a bit of feta and top with warm, sliced grilled chicken and serve right away with additional ground black pepper to taste. Nice job! Very, very close…I think Liz is going to get with you and share the one from our book here at Proud Larrys. We are flattered by your blog post, and thanks so much for the nice words! I’d love to buy your book so I can try more of your menu…can’t seem to order anything but the Grilled Chicken Salad when I am in town.